Twitter, Microsoft Messenger, and Facebook users can easily share a link to their favorite artist or playlist by using the Share button. Spotify also includes a handy Share button next to every track listing. Share buttons are also located next to artists’ profile pages and playlist listings. Clicking a Share button launches a pop-up window that lets you share the track, playlist, album, or artist page to a range of networks. It doesn’t matter how you go there; perhaps you conduct a search for the band and click its name in the results. Click the Share button below the band’s name, and then click the Twitter tab in the pop-up window that appears. This tab displays the artist page’s Spotify URL in a text box. (Optional) Customize this tweet by adding your own message to the text box. But remember that Twitter lets you type only a maximum of 140 characters per tweet. Spotify keeps a tally of how many characters you have left at the top-right of the text box. You’re directed to the Twitter website. If you aren’t already logged in, Twitter will prompt you to do so. Log into your Twitter account, if necessary. 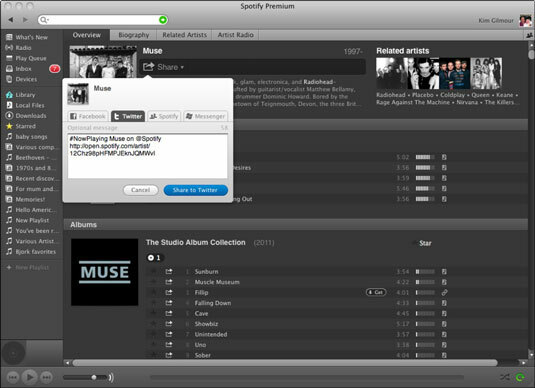 The text from your Spotify dialog box appears inside your Twitter Status Update text box. (Optional) Edit the tweet further, if you want. Click Tweet to post the tweet to your Twitter profile. Twitter recognizes the URL as a web address and turns it into a clickable link. Click the Share button, and then click the Messenger tab in the pop-up window that appears. You can type up to 512 characters in the text box to accompany the link, which can be shared as a status message. You’ll be prompted to sign into the Windows Live network if you aren’t already logged in. Sign into your Windows Live account, if necessary. A preview of your message appears onscreen. From the links provided, you can either choose to post this as a status update within the Windows Live network or send the link as an Instant Message. Click the appropriate sharing option below Share with Messenger, and then click the Share button. Anyone who sees the link in an Instant Message can click it to be taken to a web page that prompts them to launch Spotify. If they don’t already have Spotify, they can follow the links to download it. Besides linking your Facebook account to Spotify, you can also publish to Facebook playlists and links to artist profiles by using the Share button — ideal if you connect your Spotify account to Facebook but opt not to give Spotify the ability to broadcast your listening habits to your Facebook friends. To post to Facebook by using the Share button, you need to have your Spotify account connected to Facebook. Click the Share button, and then the Facebook tab. Type a brief message to accompany your link, and then click Share to Facebook. This automatically posts your message to your Facebook Wall. It also gets posted to your friends’ Spotify feeds. 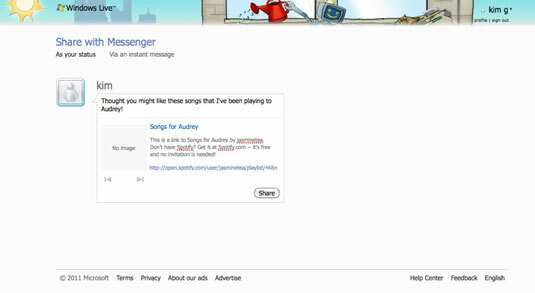 If you don’t have your accounts linked, you can still manually paste a Spotify link to your Facebook status update. After you click the Share button, you also have the option of sharing items to your Spotify friends’ Inboxes by clicking the Spotify tab on the pop-up window that appears.